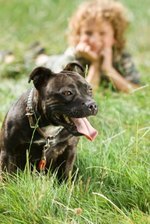 Different pit bull breed puppies, including American pit bull terriers, Staffordshire bull terriers, American Staffordshire terriers, and everything in-between are lovable balls of joy which sometimes get a bad rap. 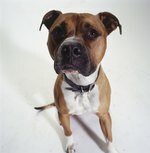 With a loving home, these stocky, muscular breeds typically grow into very loyal, fun-loving, active dogs. To account for their higher level of activity, you'll need to feed your pit bull pup more calories to suit his active lifestyle. After all, you want your little pooch to stay happy and healthy. As long as you ensure he gets the right amount of high-quality puppy food until he reaches adulthood, your little one will reach his maximum potential for healthy growth. When feeding your pit bull puppy, also keep in mind that big-chested bully breeds are prone to a very serious condition called gastric dilation volvulus, commonly known as "bloat," according to WebMD. So, don't let them eat too rapidly or feed them an hour before or after exercise.